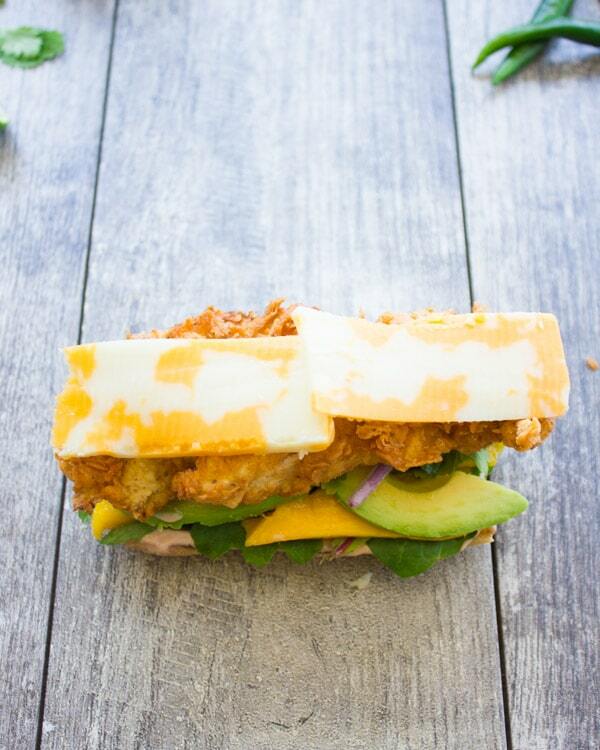 Topped with sliced mangos, strips of crispy, fried chicken breast, avocados, cheddar cheese, and a spicy and sweet Sriracha Ranch Dressing, this Mango Chicken Sandwich is an easy and fun lunch to take to the office. 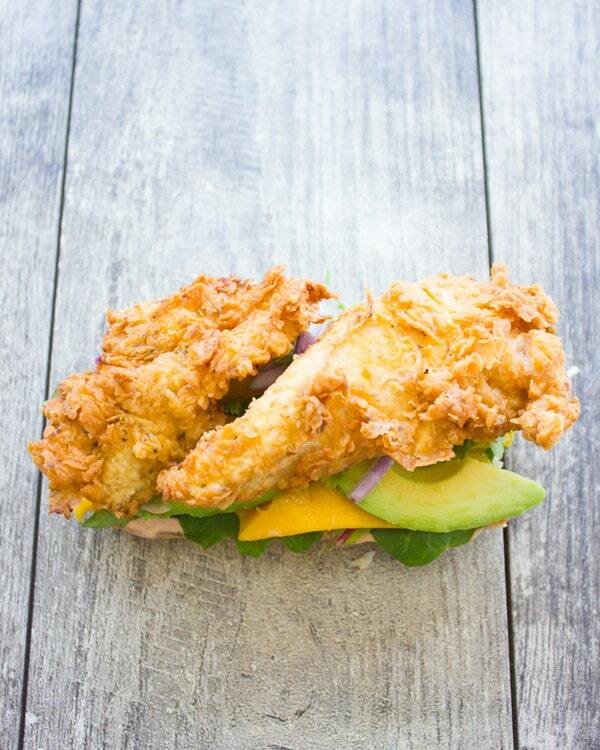 Want the best chicken sandwich you’ve ever had? 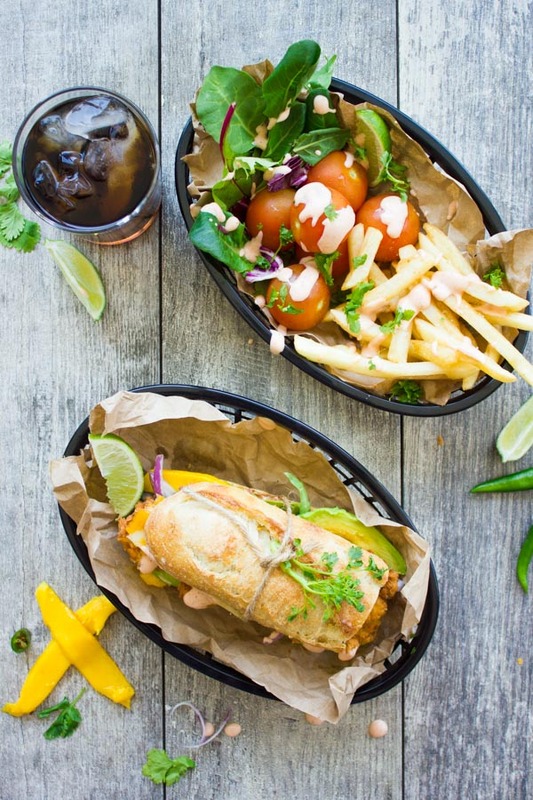 Grab a few ingredients and make this Spicy Sweet Sriracha Mango Chicken Sandwich recipe. 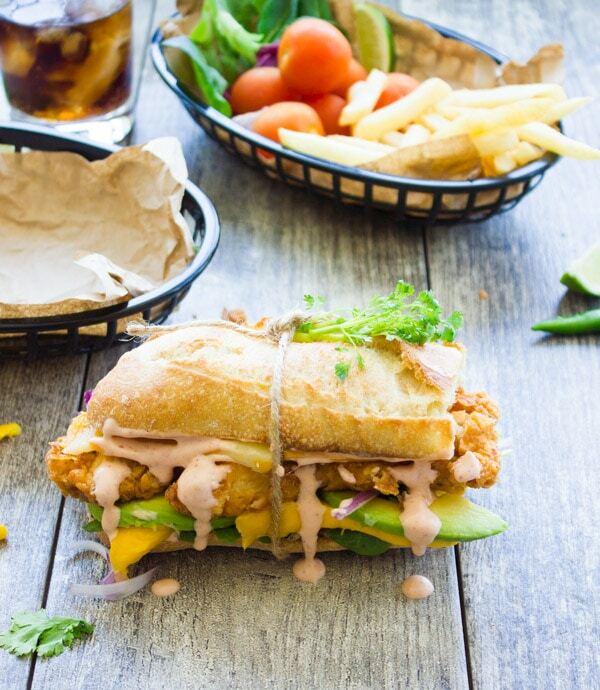 Crusty bread, creamy pink Sriracha sauce, avocado, cilantro, green chilli, mango slices, onion slices, crispy spicy fried chicken fingers and a layer of cheese which melts slightly as it sits over the fried chicken. I don’t know what it is about fried chicken that sometimes just gets into me. Just the fried stuff. Ok, you might know me more as a lover of salads and soups. And I absolutely LOVE those meals. But there are just fried chicken sandwich kind of days. It’s what I’m craving sometimes and deep down I’m hoping that I’m like everyone else. 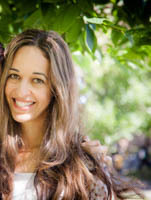 Do you get those crazy cravings for super healthy meals or decadent sweets or for fried junky foods too? 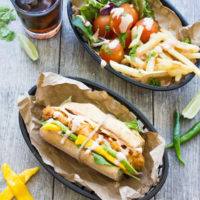 I love the combo of mango and spice in this chicken sandwich ( did you miss my Spicy Mango Chicken Wings with my easy quick homemade mango chutney?). For the sauce, I simply mixed some Sriracha sauce with some ranch dressing for a Sriracha ranch sauce-YUM! For the chicken, I used my method for making the BEST Spicy Fried Chicken Fingers. I strongly urge you to try that recipe—it’s go-to to fried chicken fingers recipe, it’s a recipe I get asked for every SINGLE time someone tries it for the first time, and I share my favorite tips of making endless variations of it! As for the toppings, I went with avocado, some cilantro leaves, a bunch of greens, some red onions, some green chilli (or jalapeño) and some marbled cheese. The type of bread you chose is totally optional and will define the character of your chicken sandwich. I chose a crunchy ciabatta style baguette, but a good old burger bun works perfectly well here. It’s your choice of how you want your chicken sandwich to be. I fried the chicken in my handy dandy deep fryer. Yes I have one, and at times like these I love it. Then I went ahead and put some fries in. YES indeed I did. Toast the bread and slather it with some sriracha ranch sauce. 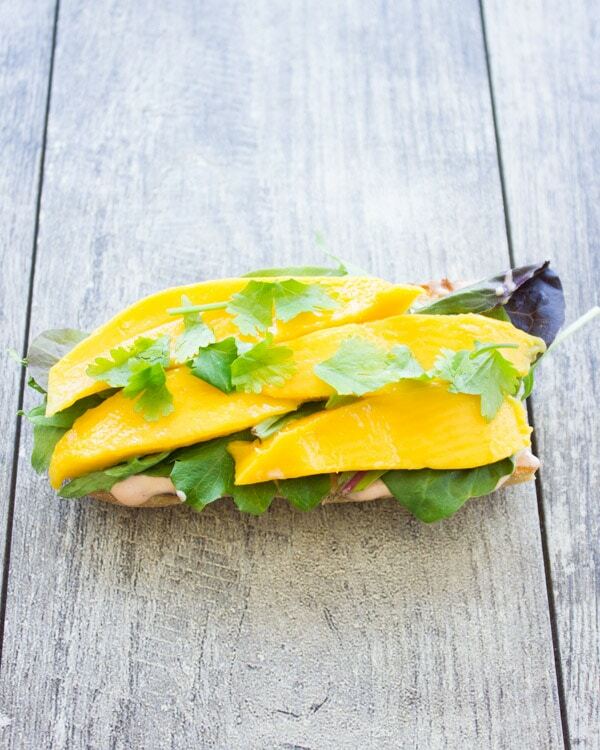 Top with greens, mango slices and some fresh cilantro leaves. 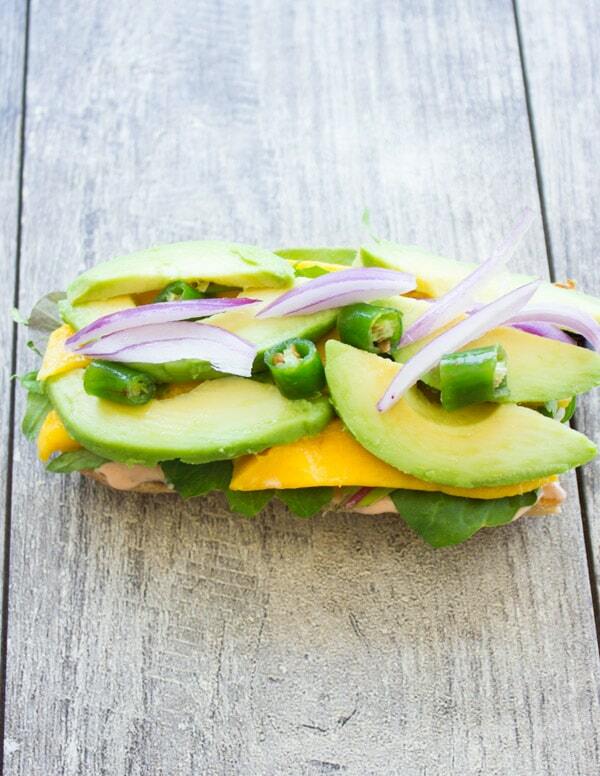 Add some avocado slices and red onion rings as well as some sliced chili peppers (optional). Now, it’s time to add that chicken, you’ve prepped in advance. Put the cheese on top of the still warm chicken to get a slight melt! And you are done! Sliced peaches, pears, apples, blue cheese, goat cheese, Monterey Jack, Swiss cheese, feta cheese, sliced tomatoes and olives make for great toppings. 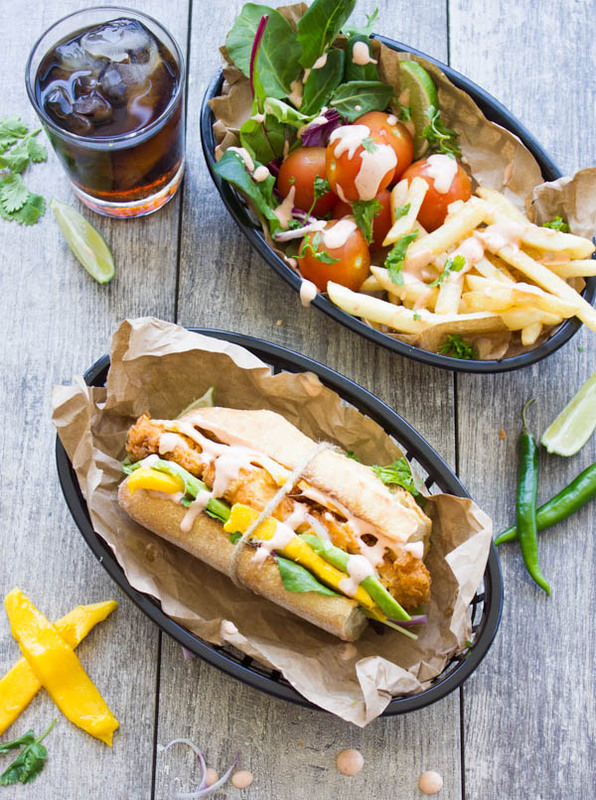 Turn your Sriracha Mango Chicken Sandwich into a wrap using soft naan bread or tortillas. Skip the sriracha and use habanero chili sauce to make habanero ranch sauce, or use roasted garlic or chopped preserved lemons to flavor the ranch dressing to your liking. 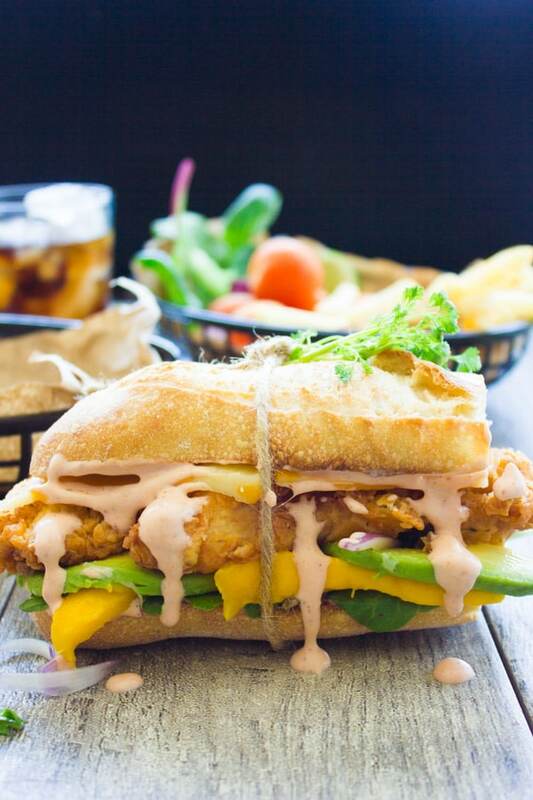 Topped with sliced mangos, strips of tender, crispy, fried chicken breast, avocados, cheddar cheese, and a spicy and sweet Sriracha Ranch Dressing, this Mango Chicken Sandwich is an easy and fun lunch to take to the office. Cook the chicken according to the recipe. Chose your favorite type of bread, toast it if you prefer. 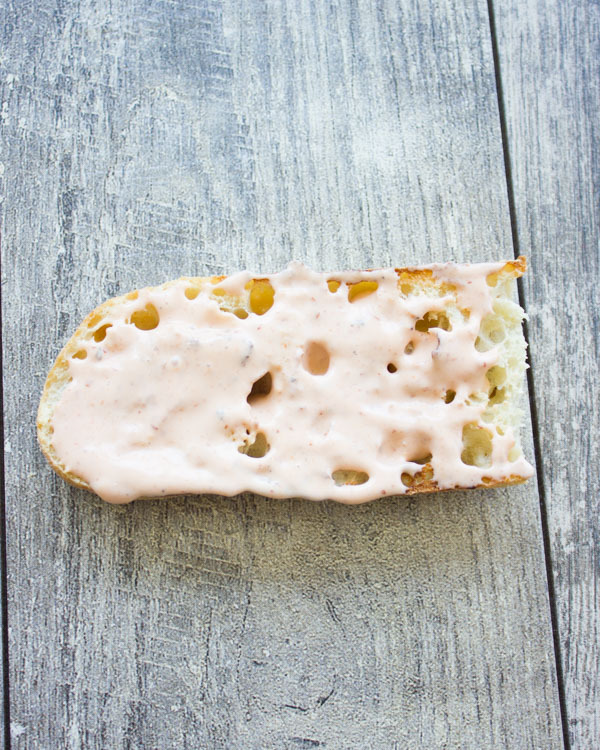 Make the Sriracha Ranch by mixing the Sriracha sauce and ranch dressing in a small bowl. 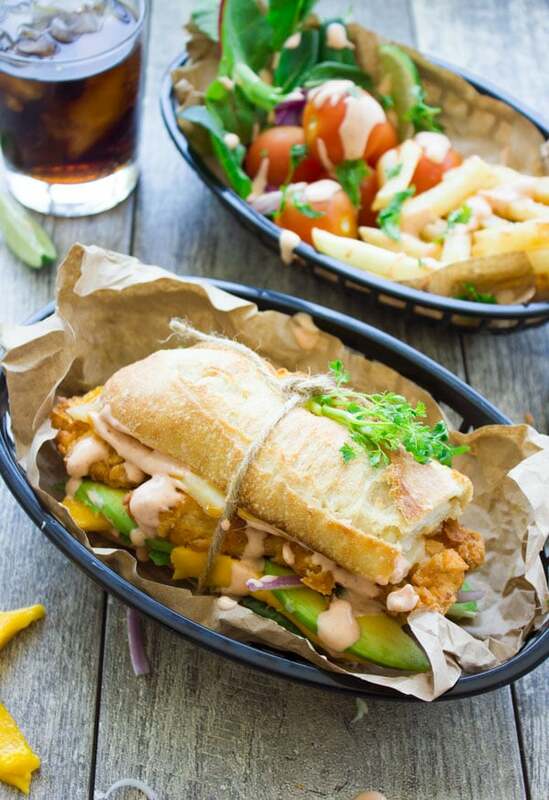 Spread a couple tablespoons of the Sriracha sauce at the bottom of your bread, layer the greens, mangoes, avocados, chilli, cilantro, sliced onions and then top that with the fried chicken fingers. Sliced peaches, pears, apples, blue cheese, goat cheese, Monterey Jack, Swiss cheese, feta cheese, sliced tomatoes, and olives make for great toppings.